Arlene Duston is President of the Deer Valley Charter Schools Inc. Board of Directors. 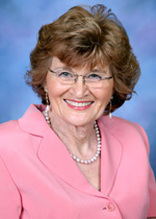 She became a member of the Board of Directors for the charter prior to its opening and served as Secretary-Treasurer. Duston has volunteered on various educational boards including 16 years on Deer Valley Unified School District Governing Board, Arizona School Boards Association, AdvancEd (North Central Association) Arizona State Committee, NCA Executive Committee, Arizona Distance Learning Association and Greater Phoenix Educational Management Council. She was recognized as an All Arizona School Board member and NCA Circle of Excellence Award winner. Mrs. Duston holds a bachelor’s degree from Kansas State University. While Mrs. Duston was employed at Blueprint Education, a distance leaning and alternative education organization, she served as a member of the planning team to open the charter schools then directed Hope High School Online, an Arizona virtual school. She also worked in public relations and academic roles. Mr. Stong heads Mondo Creative, a media development company. He is also a principle partner in Anomic Solutions, a company created to dissuade children from engaging in criminal activity. David moved to Arizona from Honolulu, Hawaii, where he spent several years creating memorable designs and illustrations for high visibility projects. He designed the logo commemorating The 50th Anniversary of the End of World War II, where he met President Clinton and the First Family and had President Clinton sign an original copy of the commemorative poster. Mr. Stong received an Emmy Certificate for video graphics and special effects on the Emmy winning documentary Simple Courage about the life of Jesuit missionary Father Daimien. He was the second Hawaiian artist to have a design selected for an Amerivox Collector’s Edition phone card. In addition, he was profiled in the Pacific Business News, received recognition from the Pacific Rim Institute for Service Excellence, and was a recipient of the Hawaiian Medallion Award for Excellence in Graphic Design. David has been selected as a judge for the Idea Crossing Innovation Challenge and for the Thunderbird School of Global Management Sustainable Innovation Summit since their inceptions. Moreover, he was selected for inclusion in the America’s Registry of Outstanding Professionals and the prestigious Marquis Who’s Who in the World. He has served on the Deer Valley Academy charter high school Board of Directors since 2004. Mr. Stong is an experienced teacher and trainer. He earned a BBA and MBA through the University of Wisconsin system. There, he was the Assistant Manager at The Wisconsin Innovation Service Center, where they evaluated the commercial feasibility of new product ideas. He trained and worked with staff and ad-hoc evaluators, and led the Center’s new product development team. In addition, David was The Program Associate for the Creativity Development Division at The Center for Creative Leadership, in Greensboro, North Carolina. He taught in the Center’s creativity and leadership programs and conducted seminars and consulting projects in creative problem-solving, new product development, computer applications in creativity, high performance team building, and implementing innovation. Later, David also taught business and marketing at Greensboro College, a four-year liberal arts institution. Additionally, Mr. Stong is well-versed in advanced computer software instruction. He is one of only thirty Premiere Certified CorelDRAW! Instructors in North America. He was an Instructor in the Art & Technology Department at Glendale Community College from 1998 through 2003. David is a Program Developer and Trainer for The Future Within, a multimedia-based, youth motivational program, since 1998. Recently, he served as an adjunct professor in Web Graphic Design at DeVry University. ​Vicki Boone has lived in the Deer Valley Unified School District boundaries for more than 30 years. She is the mother of 3 children, all graduates of DVUSD. Mrs. Boone has worked for DVUSD since 1995; she has an extensive background in student management systems and IT support. Currently, she holds the position of Software Systems Analyst. Mrs. Boone is a strong supporter of student choice and the belief that all students can learn and can succeed, and she believes that options in education are important, as not every student fits the same mold of learning. Mrs. Boone is surrounded by family events with her husband Tom and their 3 children. In her spare time, she enjoys pilates, reading, movies, grabbing a sports event and biking around the neighborhood. Mrs. Boone has served as a member of Talas Homeowners Association and leader of La Leche League International. As she looks forward to retirement years, she is exploring her love for animals and figuring out how she will be able to contribute to helping shelters. Ms. Katheryn Hedges has served as a member of the Deer Valley Charter Schools, Inc. since 2016. She previously devoted over 30 years as an enthusiastic educator at various grade levels; 14 years as an Advanced Placement Government and Politics teacher at the high school level, 10 years of Political Science at the community college, and taught Social Studies at the middle school level. She has experience in staff development, coaching, leading AP Government Workshops, and grading of National Assessments. The Arizona Bar Foundation awarded her the John J. Ross Memorial Award for Teacher Excellence in Law Related Education, and she was a Teacher of the Year Finalist for the Deer Valley Unified District. She was listed in Who's Who Among America's Teachers. She coached the Deer Valley High School Mock Trial Team to win the state championship 10 times, three national finals, and a National Championship in 1997. She holds a Bachelor’s degree in Secondary Education with a major in Political Science, and a Master’s in Secondary Education.